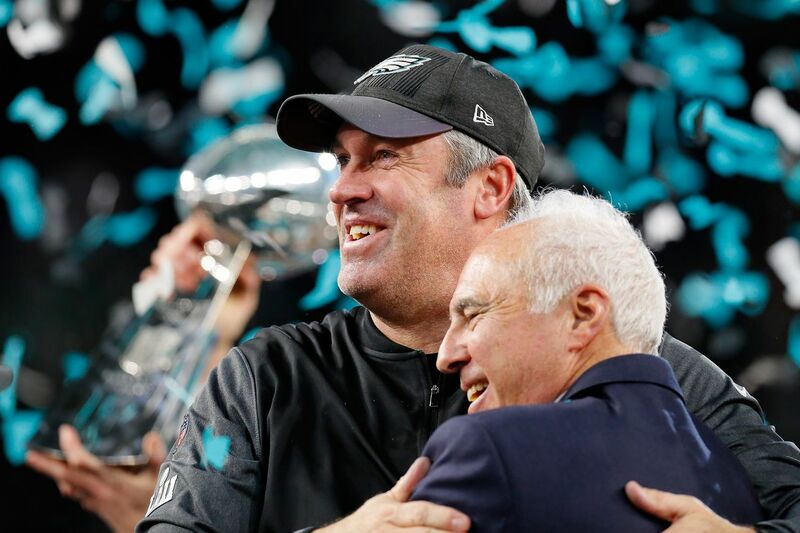 The Birds are Super Bowl Champions. In case you forgot. The week has been nothing short of magical. From the game itself and all of its twists and turns to the post-game interviews/celebrations and of course, the parade. I’ve spent my entire life dreaming of a Philadelphia Super Bowl—even the wildest of fantasies couldn’t hold a candle to this. But the wheel of time spins on, ignorant of success and failures. For 31 teams, turning to the offseason is an opportunity—for Philadelphia, it’s regrettably an unavoidable responsibility. As such, take your time—enjoy the revels and spoils of victory for as long as you like. Once you’re ready to turn to the Draft, free agency, and beyond, come on back and get updated on the Eagles’ 2018 offseason situation here. As it stands at the time of publication (February 9th), Philly isn’t in the best cap spot. By “isn’t in the best cap spot,” I mean that they’re $9.3M over the projected cap number for 2018 and dead last in the league in cap space. It’s important to remember that cap space for NFL teams isn’t inherently valuable—players are. If your team has a lot of cap space, chances are your team isn’t very good (if your team has lots of cap space and your team is good, you’re a wizard). If your team has very little cap space and your team is doing badly, chances are you’re stuck in some bad contracts—if your team has very little cap space and just, I dunno, won the Super Bowl, you did it right. Plainly, I’d rather have too little cap space because my roster is good than have a ton of cap space because my roster’s bad. Philly did it right. Now it’s time to sustain this success. Here’s a fun little nugget for you: Philadelphia doesn’t really have to make any big decisions anytime soon because of the “Top 51 rule.” When in training camp, teams carry up to 90 players—there’s no way they could fit all of those contracts under a salary cap. As such, teams’ salary cap is measured during that period by the sum of the Top 51 contracts (ranked by value), as well as all of the pro-rated bonus money, injury money, dead cap, et cetera. When you consider only the Top 51 contracts for Philadelphia, the money they need to recoup is halved ($4.8M). This Top 51 rule gives Philadelphia time to consider who they may release or trade—decisions that may also be contingent on the players they’re able to draft. We’ll get into the Draft a touch later. For now, let’s look at the potential moves we could see freeing up some much-needed room for Philadelphia. WR Torrey Smith: The easiest out of them all, Torrey Smith holds no dead money on his contract, and would put $5M back in Philadelphia’s pocket. Nobody signs that sort of deal unless they know they’re a Super Bowl loaner. Smith’s likely out the door. 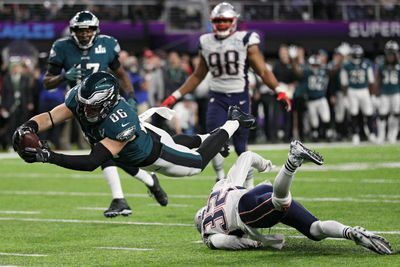 TE Brent Celek: The longest-tenured Eagle who finally made it to the Promised Land, I’d be coming to Brent and asking him to restructure. He’s a free agent after the 2018 season, at which point he’ll be 34. Nobody’s signing him at that age. If Celek is unwilling to spread his final year ($5M cap hit) into two seasons of cheaper play, it hurts, but you should cut him ($1M dead; $4M saved). P Donnie Jones: Another easy pick. Jones (37 years old) counts $1.875M against the cap in 2018, $1.625M of which can be saved by cutting him. Despite his Ironman work for Philadelphia over the past seasons, I think we’ve arrived at the cliff. P Cameron Johnston has been waiting in the wings for a while now. Philly should make the switch. LB Mychal Kendricks: After years of trying to move him, Philadelphia finally made it to 2018, the year in which it makes financial sense to cut Mychal Kendricks ($3.2M dead; $4.4M saved)—but will they? Kendricks played his best ball of recent memory, and Philadelphia is thin at LB. I’d still test the trade market on Kendricks given his improved play, but I don’t think you cut him. If he regresses back to shaky play, cut him in 2019 ($1.6M dead; $7M saved). OT Jason Peters: Spoiler alert: It’s not gonna happen. Jason Peters was playing the best football of his career before he went down this season—at 35 years old! You’d kill more cap ($6.33M) than you’d save ($5.33M). Draft another high OT as his replacement on the left/Lane Johnson’s replacement on the right and let him learn under Peters. DE Vinny Curry: Not unlike Kendricks, this is a “test the trade market, wait, and see” situation. Curry is not in Philadelphia’s long-term plans at DE—that’s BG and Barnett. That said, Philly loves their depth on the DL, and Curry (like Peters) would cost more to cut ($6M) than Philly would save ($5M). Still 29, and now in the less onerous half of his cap, Curry could be Philadelphia’s second-hottest trade commodity this offseason in an NFL eternally seeking EDGE play. If you can’t move ‘im, keep ‘im. QB Nick Foles: And here’s Philadelphia’s hottest trade commodity. Make no mistake—as long as Foles is down with it, Roseman is going to do everything he can to move Nick Foles this offseason. You can get premium—I’m talking first-round—capital for a starting quarterback on the trade market, and that’s how Foles is inevitably viewed by at least a few teams around the league. Foles counts &7.6M against the cap, but he also has a $3M roster bonus due on 3/18. Philadelphia can get that number off of their books if they trade him before that date. Foles’ contract with Philadelphia expires after 2018, in all technicality. There are 3 years attached to the contract (through 2021) that automatically expire if he’s still on the Eagles’ roster in 2019. These years carry a cap figure of $6.1M each—if those years are team options that a squad could pick up if they trade for Foles, I imagine that would make him even more attractive a trade candidate. Assuming Philadelphia at least trades Foles ($7.6M) and cuts Celek ($4M), Smith ($5M), and Jones ($1.625M), Philadelphia will open up roughly $18.2M in cap space, which at least gives them a little breathing room (~$8M) in 2018. We can cross some depth names off the list quite easily. Ellerbe, Beatty, Braman, Goode, and Barner are all likely gone as Philadlephia returns to full health in the offseason. I don’t expect Philadelphia to bring Caleb Sturgis back with Jake Elliott under cheap contract. Only one of Corey Graham/Jaylen Watkins will likely return—I’d imagine it’s Watkins, who is a RFA, younger, more versatile, and cheaper. However, Philly will not spend the $1.9M required to sign him without allowing him to hit free agency first—as such, he will test the open market. I doubt he finds anything there. 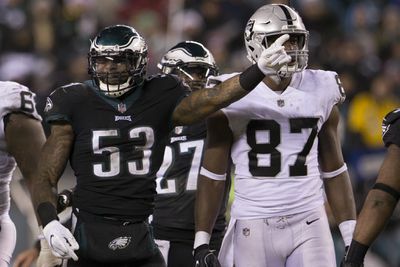 The priority re-sign for Philadelphia will be Nigel Bradham. LB is their weakest position on the defensive side, and Bradham really stepped up in Jordan Hicks’ absence. While some may worry about Bradham’s price tag, his only success in the NFL has come in Jim Schwartz’s defense. I think he recognizes that, and it makes him more likely to stay. That being said, Bradham (26 years old) should demand easily $5-$6M/year on his next contract, and will likely look for a long-term deal over a short one (his last deal with Philly was only 2 years). That pursuit of multi-year security may lower his yearly cap number a bit, and is attractive to Philadelphia, as both MLB Jordan Hicks and WLB Mychal Kendricks are in flux for the foreseeable future. As such, the pieces are there for Philadelphia to ink Bradham. I think the deal that LB Malcolm Smith got with the Niners last season (5 years, 26.5M, 11.5M guaranteed) is a good benchmark. Expect a roster bonus/potential out around 2020, the time at which Philadelphia will know if they can trust Kendricks/Hicks long-term. Regrettably, I can see neither LeGarrette Blount or Darren Sproles being priority adds. With Ajayi and Clement both under contract and second-year Donnel Pumphrey returning from IR, a cap-strapped team can’t be investing any significant capital in 30+ year old RBs. Philadelphia will put out feelers for Burton, Allen, and Robinson—the three remaining free agents—but all should find better contracts and greener pastures on the open market. 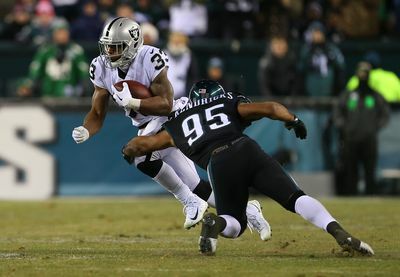 If Philly cuts Celek/Smith, they may be able to sell Burton on way more playing time, but so many teams are interested in Trey (26 years old) that I expect he gets a great contract elsewhere. Both Robinson and Allen have too much depth behind them at CB and DT, respectively, that Philly has no need to spend significant capital on either. The white whale is Bradham. Everyone else afterward is just a discussion on value/space available. Assuming the current cuts/free agent losses we’ve predicted thus far, let’s evaluate our personnel by position, to see the areas we need to address. I understand that some are worried that Carson will not be ready for Week 1--but Philadelphia missed 3.25 games of Carson this regular season and still got the first seed. I’d like to see them add a more experienced veteran, obviously—but they do like Sudfeld in that building. Ajayi/Clement is a marvelous 1-2 punch for 2018—but after next season, Ajayi hits the open market. Philly must figure out if Pumphrey has anything to offer at the NFL level, after a hamstring tear muddied his 2017 camp and preseason. Is Wendell Smallwood going to offer anything next year? If Philadelphia had a Day 2 selection this year, they could consider cashing in on a deep RB class, but their second-earliest pick is late in Round 4. Maybe they get lucky. There’s also a ton of practice squad dudes—Greg Ward Jr., Marquess Wilson, Rashard Davis, et cetera—who could push onto the active roster a la Johnson this year. When you look at deployment, Hollins has the inside track to take Torrey Smith’s vacated flanker position, while Shelton Gibson can hopefully provide some of the deep speed. Philly will likely bank on Hollins stepping up big-time in Year 2, and make no significant moves here. Oof. Philadelphia does have futures contracts with two interesting players: Adam Zaruba, ex-Rugby dude, and Billy Brown, current practice squader who had a solid 2017 preseason. Either way, one of the two would really have to shine to step up into the TE2 spot, which is an important role for Philadelphia’s versatile offense. There are some intriguing Band-Aid free agents on the market, like Denver’s Virgil Green, Washington’s Niles Paul, and Seattle’s Luke Willson. Keep an eye on Austin Sefarian-Jenkins if the Jets can’t/don’t keep him as well. The starting five are all signed through 2019—not just 2018—which is excellent news. While Philadelphia should look to get that OT of the future to eventually move on from Peters, they can keep playing him as long as he’s healthy and dominating. Figuring out what Isaac Seumalo brings to the table—i.e. is there a position he can actually play?—is big to riddling out the depth in years to come. Everything here looks swell. Maybe you check out your interior depth, but I thought Qualls looked good in his rookie preseason, and Shittu is a fine depth piece in the NFL. Brandon Graham ($7.75M cap hit in 2018) is a free agent in 2019, and I would start negotiations for his extension yesterday. Restructuring could also open up some more cash this year. If you’ve got this around Draft time, you did a great job. Things are still in flux for the future, however—Hicks is a free agent in 2019, and how much are you willing to pay his availability? Could Kendricks be gone once the right offer comes by? What does Nate Gerry become? I’d love to see Philadelphia add a rookie to this group, just to buy some security for the future. If things go sideways with Bradham/Kendricks, just may just have to go Round 1. With Robinson gone, plug the hole at nickel with either Jones (if you want to leave Mills outside, which I don’t) or move Mills inside and get Jones outside (my choice). A great tackler and decently quick, Mills should be fine in the slot—though getting a backup body (Philly has reserves/futures deals with 3 DBs currently) for dime and quarter packages is key. Developing Douglas as an outside player could be huge when it comes time to negotiate a contract with Ronald Darby (2019). It’s put up or shut up time for Watkins, who needs to prove he can back up Malcolm Jenkins/play in 3-safety packages with his coverage versatility. While both Jenkins/McLeod are signed through 2020, a young safety to supplant Maragos on the depth chart and eventually start would be quite welcome through the draft. If Watkins can’t become a Jenkins-esque player, drafting a safety become even more of a priority—and remember, they may lose Watkins on the market and be forced to get a new guy regardless. Not the names we’re accustomed to seeing, huh? Only question here is: who’s returning kicks and punts? Pumphrey? Smallwood? Gibson? Philly needs better return work than they got this season. Given that Philadelphia won’t have much cash for free agent deals, they’ll likely fill their holes through the Draft. Philadelphia’s roster is quite sound—even for a Super Bowl winning one—so the mountain isn’t too steep. You’ll notice the dearth of 2nd and 3rd round picks—this is an ill that just screams “Howie Roseman.” Having lost these pieces in the Carson Wentz trade (2nd) and Ronald Darby trade (3rd), Roseman will look to snag at least one back in a deal for Nick Foles (early 2nd feels like a decent asking price; we’ll see if he can’t turn it into a late 1st). As we’ve discussed, Philadelphia needs an OT of the future, a potential starting LB, promise at the S position, and a backup TE most desperately. Beyond that, bastions at WR, CB, RB, and DT could all be welcome. 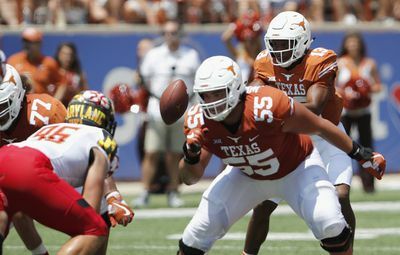 Connor Williams (Texas) is the prized commodity here, though an injury-marred 2017 campaign puts his Draft stock in a weird spot. If his Combine medicals are clean and he’s at full health for drills, his stock will be out of Philadelphia’s reach—if not, he could slip, and Philly could look to cash in. Beyond Williams, Orlando Brown Jr. (Oklahoma), Tyrell Crosby (Oregon), Martinas Rankin (Mississippi State) and Chukwuma Okorafor (Western Michigan) are the names you could potentially hear around this spot. Of those, Crosby and Rankin both fit Philadelphia’s scheme/style best, in my opinion. Don’t get sucked in by the Mike McGlinchey (Notre Dame) talk—he’s not very good, from my evaluation. The sleeper? That’s Alex Cappa (Humboldt State), whose athleticism and ferocity are a bit Lane Johnson-esque (Cappa isn’t the same size, however). Philly could go for one of the top guys, like Rashaan Evans out of Alabama, or Leighton Vander Esch out of Boise State, at 32. Vander Esch makes less sense, as he’s rather limited to MIKE, in my eyes—but Evans can play the SAM, which helps if you’ve lost Nigel Bradham. Excellent blitzer as well, Evans is. If we’re a little later into the Draft, the Eagles could swing at an oft-injured player who tumbled a bit—Shaun Dion Hamilton (Alabama), Skai Moore (South Carolina), and Matthew Thomas (Florida State) are the names to watch there. Local product Jason Cabinda (Penn State) would force Hicks out of the MIKE, but he’s a sleeper at the position; Malik Jefferson (Texas) is very raw, and I’m not sure he’ll ever pan out into a consistent three-down player. Likely in the market for safety around Rounds 3 and 4, Philadelphia should look for smaller school products. Trayvon Henderson (Hawaii) has deep range and good ball skills; Jeremy Reaves (South Alabama) has coverage versatility and great physicality. Don’t sleep on Stanford’s Justin Reid either—he can play all over the place, as can Jessie Bates III, the young kid out of Wake Forest. Pushing later into the class, Siran Neal (Jacksonville State) has experience at LB, WR, and CB across his high school and college career—it’d be fun to get him into the building and see what you can make of him. I’m wary of the hype you may see on Quin Blanding (Virginia)—he’s athletically limited. You can find tight ends with contributor’s ability almost anywhere in this class—Philadelphia may very well do just that, in an effort to stay under budget. Chris Herndon (Miami) and Troy Fumagalli (Wisconsin) are two early Day 3 targets Philadelphia could like for their blocking ability, which they’ll miss in Celek’s absence. If they want to bring on a Burton-esque pass-catcher first, look for UMass’s Adam Breneman and Central Michigan’s Tyler Conklin. Both are woeful when inline but have extreme pass catching upside—Breneman just has a huge injury history, and Conklin isn’t much of an athlete. Folks sleep on Durham Smythe (Notre Dame) who has solid blocking ability and flashed some pass-catching upside in Mobile, Alabama at the Senior Bowl. If he continues to stay hush-hush, he’s the apple of my eye on Day 3 for Philly.